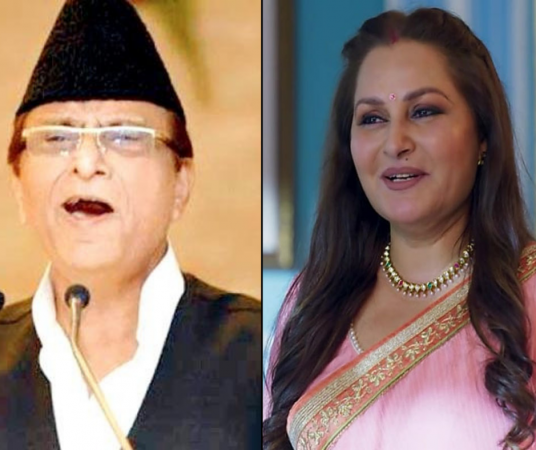 Azam Khan clarified that he did not make any objectionable remarks against actress-turned-politician Jaya Prada, who is contesting the Lok Sabha polls 2019 from the Rampur constituency on the BJP ticket. Samajwadi Party leader Azam Khan and BJPcandidate from Rampur constituency Jaya Prada. The police have lodged a First Information Report or FIR against senior Samajwadi Party (SP) leader and former minister Azam Khan for his objectionable 'khaki underwear' remark against film actor and the Bharatiya Janata Party (BJP) candidate Jaya Prada. The development comes after Khan on Monday, April 15, clarified that he did not make any objectionable remarks against Jaya Prada, who is contesting the Lok Sabha polls 2019 from the Rampur constituency on the BJP ticket against him. Azam Khan's clarification came after he made a below-the-belt attack against the actress-turned-politician. "I brought her (Jaya Prada) to Rampur. You are a witness that I did not allow anyone to touch her body. It took you 17 years to identify her real face but I got to know in 17 days that she wears khaki (Khaki is identified as the colour of the Rashtriya Swayamsevak Sangh, the ideological mentor of the BJP) underp****," said Khan while addressing an election rally. The Samajwadi leader told news agency ANI that he would withdraw his candidature from the ongoing elections if proved guilty. He also asserted that he did not name anyone. "I have said that people took time to know real face in reference to a man once said that he brought 150 rifles with him and if he sees Azam, he would have shot him dead. My leaders also did a mistake. Now, it has been revealed that he has an RSS pant on his body. Short is worn by men," Khan told the news agency. "I was a nine-time MLA from Rampur and been a minister. I know what to say. If anyone proves that I have named anyone and insulted anyone by name. If it is proved, I will step back from the elections," he added. Azam Khan also accused the press of misinterpreting his remarks. However, it was earlier reported that Azam Khan allegedly made the remark in the presence of former Uttar Pradesh Chief Minister Akhilesh Yadav and other senior party leaders, who were present on the dais. BJP spokesperson Chandra Mohan condemned Azam Khan's comments, saying that his remarks were disgusting and embarrassing. National Commission for Women Chairperson Rekha Sharma termed Azam Khan's alleged below-the-belt remarks against Jaya Prada as "extremely disgraceful" and said the women panel will be sending a show cause notice to him. Reacting to Khan's remarks, she tweeted that the NCW would also be requesting the Election Commission to bar him from contesting elections. The election for 80 Lok Sabha seats in the state of Uttar Pradesh is scheduled to be conducted in all seven phases. Eight seats in the state went to polls in the first phase on Thursday, April 11. The final phase of voting will take place on May 19. The results will be announced on May 23.